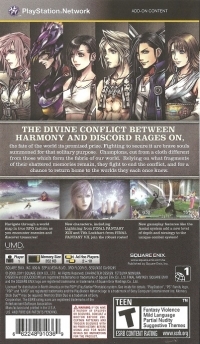 Box Text: THE DIVINE CONFLICT BETWEEN HARMONY AND DISCORD RAGES ON, the fate of the world its promised prize. Fighting to secure it are brave souls summoned for that solitary purpose. Champions, cut from a cloth different from those which form the fabric of our world. Relying on what fragments of their shattered memories remain, they fight to end the conflict, and for a chance to return home to the worlds they each once knew. 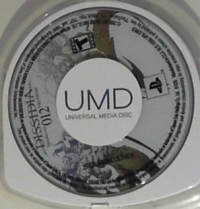 This is a list of VGCollect users who have Dissidia 012[duodecim] Final Fantasy in their Collection. This is a list of VGCollect users who have Dissidia 012[duodecim] Final Fantasy in their Sell List. 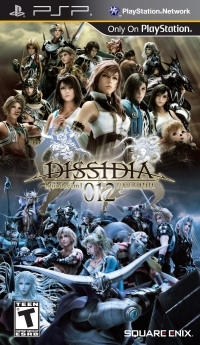 This is a list of VGCollect users who have Dissidia 012[duodecim] Final Fantasy in their Wish List.